Liquid Silk Minnesota rivers can fill quickly after a rain and when they do the water runs rapidly to the lakes and larger rivers. This is no more easily observed then along the shore of Lake Superior. The drop in elevation produces many spectacular rivers that are a showcase of waterfalls and cascades. 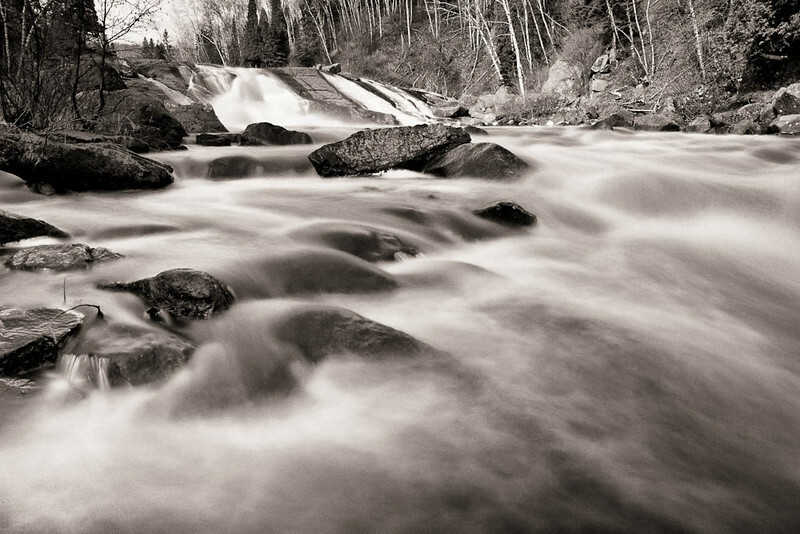 Slowing the speed of the camera shutter tames this water giving it a smooth, graceful and silky appearance. These images were made over the course on one weekend in October 2010 after such a storm. These images are contained in a beautiful interactive PDF. The PDF is free. You can get by simply clicking on Download Liquid Silk. Most browsers will open the PDF in a browser window. However it's best to download the PDF and view it in full screen using Adobes free Acrobat Reader.